Coalite is a brand of low-temperature coke used as a smokeless fuel. Coalite was manufactured by the Low Temperature Carbonisation Company, which established a manufacturing plant at Buttermilk Lane, Bolsover, Derbyshire in 1936. At the time it was the largest one of its type in the world.The ovens continued producing Coalite until the Bolsover works closed down in 2004. 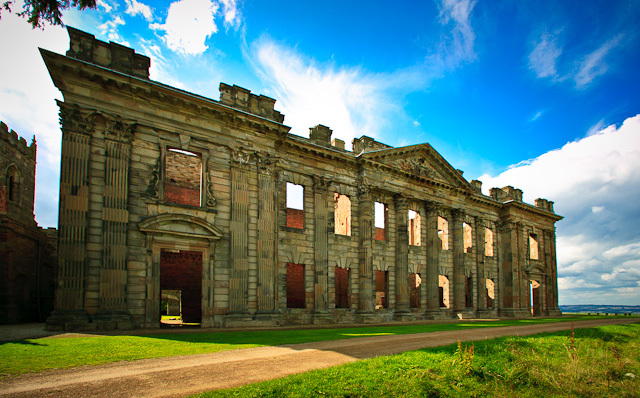 We look at Sutton Scarsdale Hall from our bedroom window almost every day. I say almost because it is on the other side of our valley and if it isn’t visible…. then the weather is bad ! The existing structure is believed to be the fourth or fifth built on the site. In 1724, Nicholas Leke, 4th Earl of Scarsdale commissioned the building of a design by architect Francis Smith, to develop a Georgian mansion with gardens, using parts of the existing structure. On a scale and quality with Chatsworth House, internally it featured both oak ornamental panels and stucco plasterwork by Italian craftsmen Francesco Vassalli and the Atari brothers; carved Adam fireplaces in both marble and Blue John, and a signature carved mahogany staircase. Following the death of the 4th Earl, Member of Parliament Godfrey Bagnall Clarke purchased the estate in 1740. After his death in 1774 the Marquis of Ormonde then gained ownership by marriage, and after his death in 1824, Richard Arkwright Junior of Cromford Mill fame, became the owner.. William Arkwright of Sutton Scarsdale was High Sheriff of Derbyshire in 1890. After many years of neglect, in November 1919 the estate was bought by a group of local businessmen who literally asset stripped the house – this went as far as removing the roof in 1920. Some parts of the building were shipped to the USA, where one room’s oak panelling was bought by newspaper baron William Randolph Hearst, who planned to use it at Hearst Castle. After many years in storage in New York, Pall Mall films bought the panelling for use as a set in their various 1950s productions. Another set of panels are now resident in the Philadelphia Museum of Art. In 1946, the estate was bought by Sir Osbert Sitwell of Renishaw Hall, with the intention of preserving the remaining shell as a ruin. Scarsdale Hall is now in the care of English Heritage, and is freely accessible to visitors. A 38 mile cycle ride to bag this photo ! There is something strangely iconic about the mining industry in Britain. 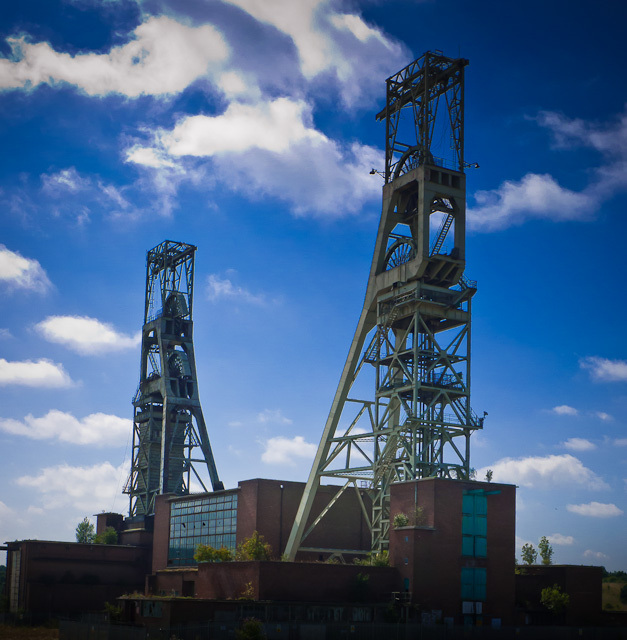 The Period of decline which led to the strikes and civil unrest experienced during the 1980′s made mining the Industry that symbolized Britain’s industrial decline. The result was the mass closure of pits and works in the years that followed. 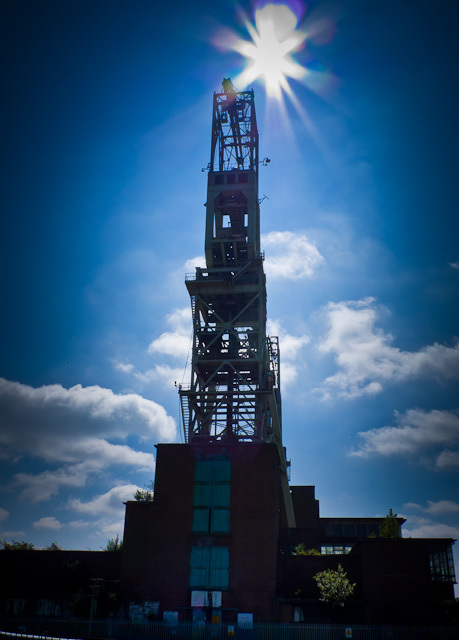 In 1922 the shafts were sunk at Clipstone colliery to exploit the top hard seam. In 1950′s the National Coal Board Conducted a series of modernisations deepening the shafts and creating the present day head stocks. Standing at 65 meters they were once the second tallest in the world when they were built. The mine operated until July 2003 when it was decided the remaining reserves were no longer economical. 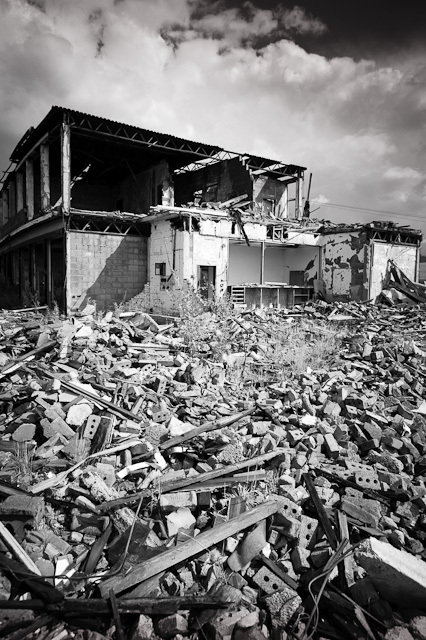 The following year saw vandalism and demolition remove the offices and shower blocks. But under the protection of a conservation order the headstocks and winding house survived. A recent poll among local residents found in favor of demolition and it is now likely that these impressive structures will be demolished in favor of a business park. I couldn’t make my mind up which photo to use today so the reserve is here too. I like the picture but it isn’t clear that it’s a mine headstock. Any views? 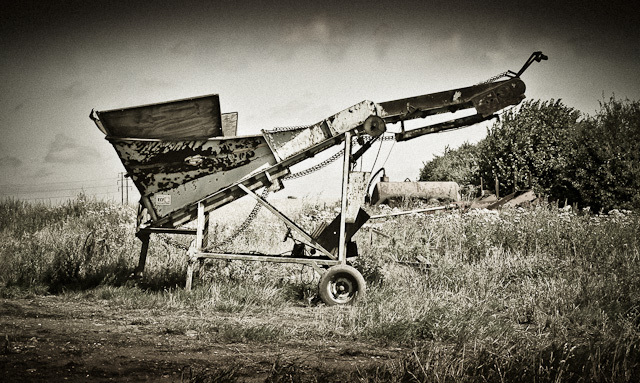 A piece of derelict farm machinery in a local field….but it could be an ageing jet fighter !!! 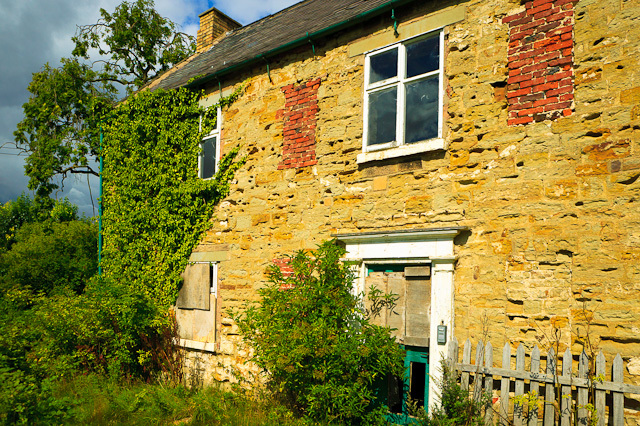 This building on Church Street in our village has been a poor state for several years. It looked as if renovation work would start a couple of years ago, but it didn’t happen. 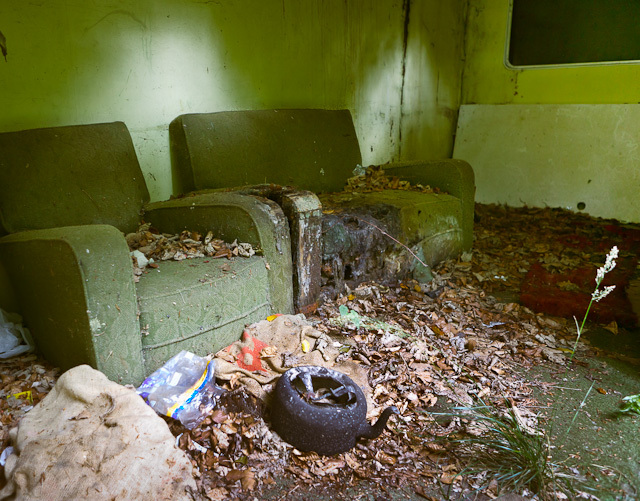 This derelict caravan is all that is left of an education facility in nearby Whitwell Woods. The building is now in a sad state. It was used to teach children about this ancient wood which has a great deal of Roman History. Two early encampment sites have been found, elsewhere Roman pottery shards dated from 2nd to 4th centuries A.D. and the medieval ridge and furrow ploughing has left earth banks to the west and south parts of the wood. One large earth bank, known locally as the Kingdom Bank, stretches from the eastern edge to the north escarpment and must have been much higher in the past. It was possibly part of the boundary between the Saxon Kingdom of Mercia and Northumberland. A wander around the old industrial area of Kelham Island in Sheffield. Kelham Island is one of Sheffield’s eleven designated Quarters. Formerly an industrial area, the island itself was created by the building of a goit, or mill race, fed from the river Don to serve the water wheels powering the workshops of the areas’ industrial heyday. The quarter was named after the island, however, the boundaries extend beyond the physical island created by the river and goit. One of the most impressive derelict buildings in this area is Green Lane Works. Very difficult to photograph because it is well boarded up hopefully for future preservation works. 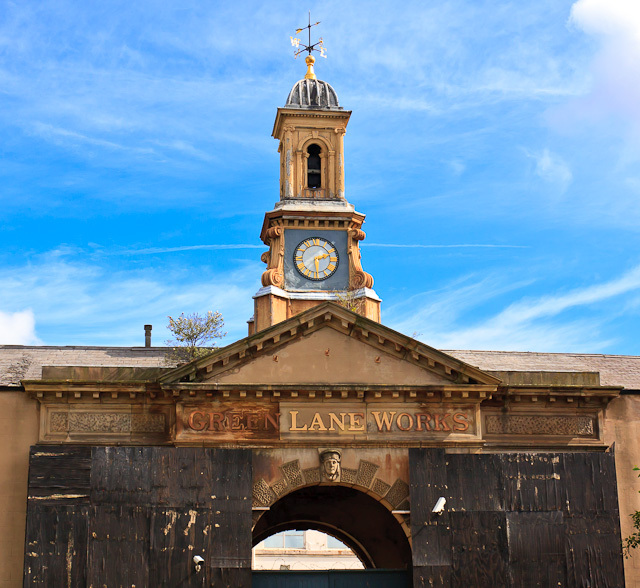 The entrance gate to the works is particularly ornate and has been designated as a Grade II* listed building. Nikolaus Pevsner called the gate “the most spectacular survival of factory architecture in the city”. The works are situated in the suburb of Neepsend within the Kelham Island Quarter of the city and date from 1795 although they were extensive alterations in 1860. The original Green Lane Works were established in 1795 by the firm of Hoole and Company who were manufacturers of ornamental stove grates and fenders in Bronze and metal. The firm flourished and their products won a first Council medal at theThe Great Exhibition of 1851 and a Medaille d’honneur at the Exposition Universelle of 1855. This success brought considerable prestige to the firm and its proprietor at the time Henry E. Hoole. In 1859 Hoole was elected Lord Mayor of Sheffield and to celebrate this he had major alterations carried out to the works. The most important part of the 1860 rebuilding was the construction of the decorative entrance arch on Green Lane. It is thought that the sculptor Alfred Stevens designed the gatehouse and may have been responsible for the relief sculptured decoration. Stevens had worked for Hoole and Company between 1850 and 1852 as chief designer on a salary of £20 per annum and had designed much of the firms award winning work for the 1851 exhibition. When he returned to London after two years with Hooles he left behind him many drawings and designs for apprentices to study. The Gateway is constructed of ashlar, stucco and brick and takes the form of a tripartite triumphal arch with a carving of a female head on the keystone above the main (central) arch. The two outer (pedestrian) arches have relief panels of the Greek gods Hephaestus (left) and Athena (right) above them. The name of the works is carved above the central arch and above this is an apex roof which at one time had a coat of arms on it which is now missing. The gateway is topped off by acupola with clock and weather vane. The works continued to make stove grates and fenders until 1930, up until 1948 it produced files as part of the Ibbotson Brothers group. In April 1948 the works were purchased by W.A. Tyzack who produced agricultural tools and parts for farm machinery. In late 2010 the works are disused with its future unknown. The gateway has been partly bordered to protect it from vandalism. The entrance gateway in the early 1860s just after being built.